The Yamaha YDP-142 is a digital grand piano with an 88-note weighted action keyboard. It’s sound sampling relies on Yamaha’s famous CFIIIS grand piano offering numerous levels of sound dynamics. Its weighted action is modeled after the hammers of an acoustic piano offering heavier touch in the low tones and lighter touch in the high tones. Sounds good so far? It sure is worth taking a better look at this magical piano. The touch sensitivity can be used in three ways to accommodate playing style. The damper pedal offers continuous or half-damper response for enhanced control. The YDP-142 also features several built-in voices from a number of instruments including organs, the harpsichord and the vibraphone. The YDP-142 comes in two finishes black walnut and a dark rosewood. The Yamaha YDP-142 utilizes Pure CF sampling of its celebrated CFIIIS concert grand piano. This method offers a number of dynamic levels between fortissimo and fortissimo to provide the most impressive performance ability. The piano’s weighted action make the touch feel heavier in the bass notes and lighter in the high tones. This action is essential for those that need to learn proper playing technique before transitioning to an acoustic piano. The YDP-142’s digitally reproduced Damper Resonance creates an authentic sound of interaction between strings that is traditionally only heard in acoustic pianos. The piano offers a pedal control that can be continuous or sustained with half-damper. 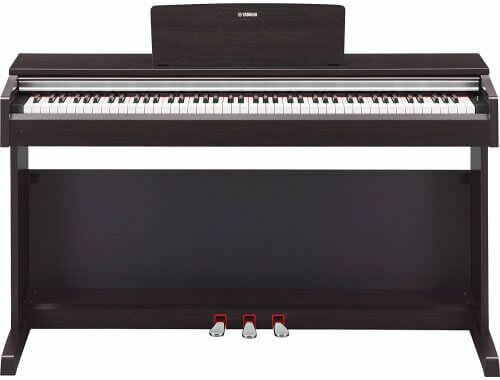 Yamaha’s Acoustic Optimizer technology uses a specific position within the piano to adjust the acoustic output. This controls the resonance and enhances the instrument’s sound. Thanks to this technology, the YDP-142 has become one of the best sounding digital pianos on the market. The track recorder helps learners keep track of progress by recording and playing back performances. The performances of each hand can be played separately for practicing melodies and harmonies one at a time. Two players can use the piano at once, allowing teachers to play alongside students. In addition, new players may take advantage of the piano’s 50 built-in songs to learn classic beginner pieces right away. Like other Yamaha digital pianos the YDP-142 lives up to its expectations with its CF sampling technique. This method of capturing true grand piano sound makes playing much more impressive and authentic. The graded hammer action also boosts the sound effects along with a touch offering three levels of sensitivity. The keyboard feels pretty good, I would say, it’s one of best weighted keyboards that digital pianos have to offer. The YDP-142 also comes with three standard damper pedals with half-damper operation on three different forms. Also beneficial are the piano’s color choices. For versatility the Yamaha YDP-142 comes in two separate finishes to match with surrounding décor. One drawback users report is the lack of portability in the piano due to its weight. There is also the light plastic feeling of the piano’s keys. Realistic Audio – The YDP-142’s CF sampling provides for a rich and true grand piano sound. This makes it suitable for important stage performances. Responsive – The piano’s graded hammer action provides a response that is true to form for enhanced realism. Touch – The YDP-142 possesses a touch sensitivity reminiscent of a grand piano with three separate levels. Appearance – The piano comes in two finishes, black walnut and rosewood, making it an esthetic enhancement to any interior. Pedals – Three damper pedals with half-damper operation reproduce the string interaction that occurs when the pedal is pressed and released on an acoustic piano. Weight – Users report problems with portability as the digital piano is a bit on the heavy side. Feel – Some players also complain about the light plastic feel of the keys that is not like that on an acoustic grand. The Yamaha Arius YDP-142 has a number of features that make it acceptable for all needs and players of all skill levels. It relies on a sophisticated sound engine with sampling from Yamaha’s standard concert grand CFIIIS piano. Its realism is felt with its Graded Hammer Action keyboard, giving it professional and training capability. The Yamaha YDP-142 will help aspiring pianists and seasoned stage performers reach many of their playing goals.